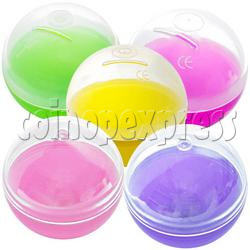 The capsules are made by soft semi-transparent plastic. Two parts make up of these balls. These products can be used to pack food, toys or gifts, candies and so on. Then put inside redemption, vending or gumball machines. Many colors are available as screen shots. Made of soft plastic material. All types of capsules as screen shots are available, you can select any type you like. 336pcs per outer carton, carton size: W600 X D450 X H465 (mm), total 3 cartons for 1008pcs.